AppEven, the third party installer that is creating waves everywhere, is popular for all the right reasons. Since jailbreakers have failed to break into Apple’s iOS 10 so as to be able to enjoy platforms like Cydia, many were left disappointed since they just didn’t want to use the basic old iOS with no additional features and limited customization. However. AppEven came to the rescue! As an absolutely amazing alternative to Cydia, AppEven is unbelievably useful. Not only does it provide you with thousands of apps and games to install on your iPhone, it provides them with all for free. The best part? You do NOT have to jailbreak your phone to use AppEven! That’s right. All you need to do is to download the third-party installer, give it permission to download things on your phone, and you are good to go. It is perfectly safe to use and does not pose a threat in any way, neither is it illegal since there is no jailbreaking involved. App Even has particularly struck many people’s fancy because there is no expertise involved in running it. You don’t need to know your way around jailbreaking, neither do you need to fiddle with your Apple ID. It is as simple as downloading an app on your phone, except that you have to download this one from outside the limited App Store. While AppEven is great, you might find that you need to delete it from your phone. That’s okay; perhaps you wanted even more functionality, or perhaps you just have space issues on your phone. 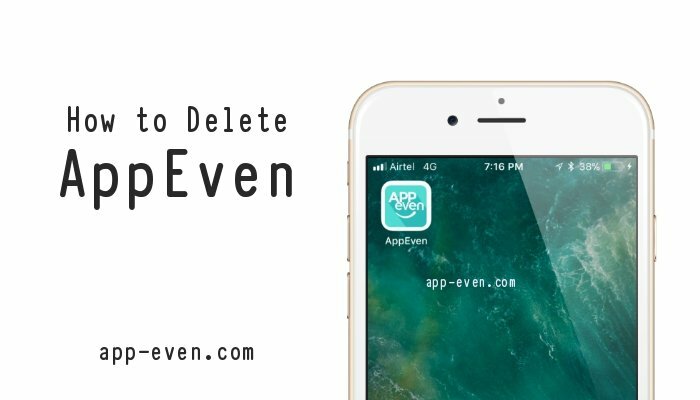 Either way, a good app makes sure it provides you with the easy option to completely remove it from your phone, and that’s exactly what AppEven d0es. Here is how to delete the app in case you absolutely must. Don’t worry; even if you delete AppEven, re-downloading it will be as simple as the first time. You can come back to it any time you like! You can delete the app with two main methods, depending on your level of tech expertise. On your Home screen, find the icon for AppEven. Press and hold the icon, without actually opening it. All the app icons on your Home screen will now begin to wiggle, with small crosses on the top right corners. Tap the cross on top of AppEven. Confirm by tapping Delete. AppEven is now completely removed from your Apple device. Find AppEven and tap on it. Confirm by tapping Delete on the confirmation pop-up. App Even will now be removed from your phone. Both methods will make sure the app and all its data are removed from your phone. However, any time you get bored, remember that you can install it right back! Let us know your experiences when you are using AppEven on your iOS device updated to latest iOS version or if you get any difficulties when you are using it. Like and Follow us on our Facebook page to get more latest updates on AppEven.